Add PieceProtect Warranty Plan for only $3.60 Do not fear breaking your bubbler! Add our PieceProtect Warranty Plan protection warranty and we'll insure this purchase against future breakage. If you break this piece, your next one is 50% off! Learn More About PieceProtect Protection ? 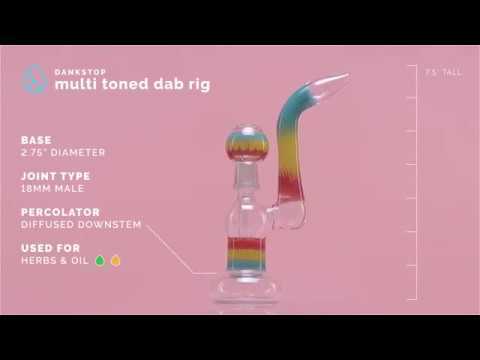 This dab rig features an intricate multi-toned colored glass pattern on the chamber, bent neck, and dome. Different colored glass shades are woven together into a stunning design that is sure to stand out in your glass collection. This concentrate pipe features an 18mm male joint, a matching 18mm female dome, and a bent neck to eliminate splashback. Inside the chamber is a diffused downstem that contains slits to optimally filter and diffuse your vapor for smooth hits every time. This concentrate rig is made from thick borosilicate glass and features a sturdy rounded base. Colors are chosen at random. A circ perc is a circular percolator that usually contains numerous rings with spacing between them. This spacing and the holes/slits of the perc allow for intense filtration.